A specialist carrier is hired to deliver a mysterious case to the underworld’s most dangerous hitman. The courier delivered an empty box. 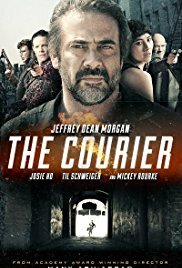 The acting performance of Jeffrey Dean Morgan in “The Courier” was enjoyable, but the story on its own is so far fetched and left more question marks at the end than any other movie. The beginning was promising, the action was at times alright. The torture scene however, I found so ridiculous … First a few fingers squeezed with a garlic press and next they just wander to the kitchen to cook something to eat, not realizing that the guy with “garlic press squeezed fingers” could (yep you hear it) liberate himself and then quite simply walk into the kitchen and shoot the two cooking lovebirds. It’s as simple as that ….. Duhuh! The Chinese girlfriend had no role of any significance. Also something absurd. When she hears that the person who actually raised her, passed away, it seems that the best remedy at that point is to start fooling around with the person she just met. Weird! And I suppose it’s just me, but I didn’t quite understand the end (I had to rewind it briefly) immediately and they didn’t need to put the name Mickey Rourke on the movie poster. Mostly you only saw his back (I suppose it was his back) and then he acts like a bad looking Elvis for 3 minutes. Besides, he really got ugly since “9 1/2 weeks“. Looks like his face is fully injected with botox. So, just another crap movie.